At least when we're talking about ballet. Do you remember those womp rats doing synchronized dancing? 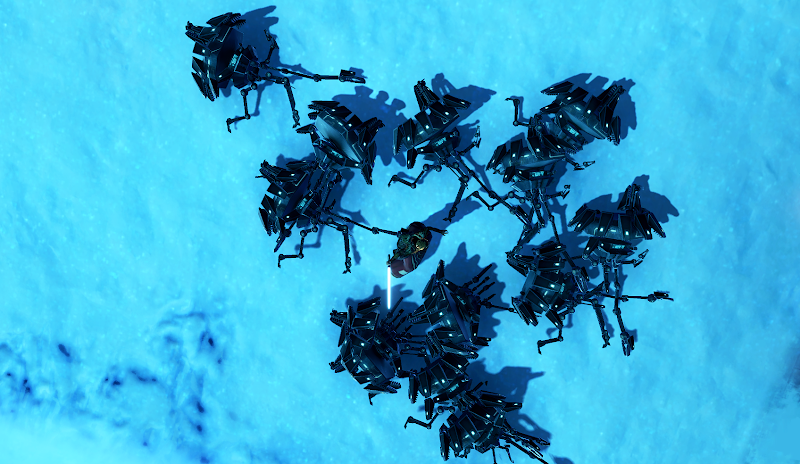 Well, it seems these droids on Ilum were jealous of all the attention they were getting on this blog and did their own synchronization attempt. Or they were merely trying to study the womp rat behaviour and imitate it, after good Gree custom. Who knows. Anyway, this is the result. Is it a circle? Is it a triangle? Or were they simply trying to impress with an irregular polygon? Who can tell? Either way, if you're in the business and you're looking to hire, believe me: womp rats over droids, hands down. We've started a "Visiting Artist" program at MU! Why don't you come give a talk! About Power Blogging! Or SWTOR, Or Guild Wars... we poor SLers are SOOOO MMORPG deprived! Share the magic! BTW, just in cast I sound like a moron, I assure you I'm totally serious! We had fantasy author Anthea Sharp on Sunday and it was a really wonderful event. LMK if you have questions, etc! I'm not really an artist, but that would be fun. I should first get into SL and find out where the uni is and how the interface works again. Maybe attend a lecture or something, to get an idea of how it works. I'll check out the website and think about what to talk about. Thanks for the invitation!